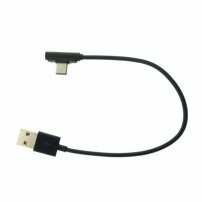 Super Short USB Type-A to USB Type-C (90 degree Angled) Extension Cable, Adapter Cable for Data Sync : allputer.com - Accessories for all your Portable Electronics & Computers! The angled (could be right-angled / left-angled / up-angled / down-angled) USB connector positions the cable in such a way that it allows you to easily access your mobile digital device / Computers in both portrait and landscape mode, even while charging. It makes no tangling, no hassle when using. - Dimensions / Length: 20cm (or 8 inch) approx. - Net Weight: 8g approx.